In our discussion of the five best small forwards of all time here at Crossover Chronicles, the names that didn’t make the list stand out as much as the ones that did. Kevin Durant will almost surely move up the list, but he’s not there yet, and his injury last season confirmed that reality for anyone trying to assess his career. Dominique Wilkins? Alex English? Mercy, they could score with anyone in the mid-1980s… but they didn’t make the cut, and moreover, they shouldn’t have. Adrian Dantley and Grant Hill were also extremely fun players to watch. Dantley was a little more rugged, Hill more naturally graceful and balletic, but they were both clever players who knew exactly what they were doing when they left their feet as ballhandlers and attackers. Their offensive skill sets ran into very few limitations. All of these players and a number of other notables were not in either top-five list. Look at those names above: Durant, Dominique, English, Dantley, and Hill. How many championships did those men combine to win? NONE. The statement is so cliched and obvious, but cliches are cliches because they’re largely true. Here’s where the conversation about small forwards gets deeper and more difficult, though: Hill played for some miserable Detroit teams. Alex English played for a mostly luckless Denver team that made a conference final once in his day but has never reached the NBA Finals. Dominique was stopped by Larry Bird in 1988, and could never lift the Atlanta Hawks to the NBA Finals, a destination the Hawk franchise has never reached since relocating from St. Louis. Dantley experienced not one cruel twist in his career, but two: He played for the Lakers in 1979, before Magic Johnson came aboard and helped Kareem Abdul-Jabbar win a title in 1980. He lost to Magic and Kareem and the Lakers in the 1988 Finals with the Detroit Pistons, and was then traded away during the Pistons’ 1989 championship season — he never tasted champagne in a Finals locker room. It’s easy to say that “winning championships is hard” when players play for luckless franchises or get traded just before an organization finally breaks through. What should be said, though, about the players who play for great individual teams and storied franchises, yet still struggle to win titles? What should be said for the man who is the best basketball player on the planet, and yet has a losing record in NBA Finals? The best of the best small forwards show us that “winning championships is hard” is so much more than a cliche. The NBA went wacky and unpredictable in the 1970s, but for the most part, it has been a “winner’s league,” in which a few champions — once they establish themselves — generally stay there, blocking the paths of other teams on the road to glory. 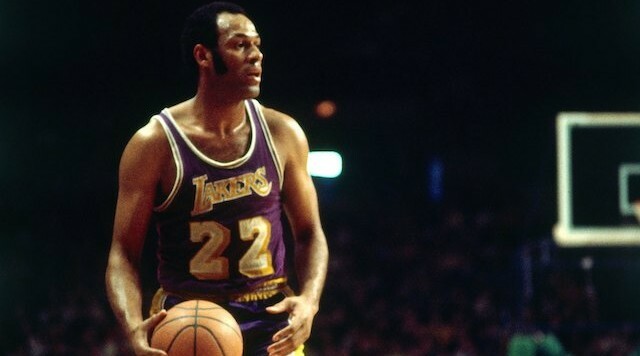 Eight times, Elgin Baylor played in the NBA Finals. Eight times, Elgin Baylor played in the NBA Finals — not just for any franchise, but for the Lakers. He lost all eight Finals series, seven to one franchise, the Boston Celtics. Losing eight of eight championship-round confrontations: That’s the Buffalo Bills and Minnesota Vikings put together. The Atlanta Braves did better in the World Series. Peyton Manning has done better in the Super Bowl. This is Elgin Baylor we’re talking about, a player who averaged at least 34 points in three straight seasons and enjoyed a peak period greater than 99.9 percent of most NBA primes of at least three seasons or more. In 1970, against the New York Knicks, Baylor’s Lakers were coming off an injury-plagued regular season in which Wilt Chamberlain barely played (only 12 of 82 contests). Los Angeles could not create enough continuity against an opponent, the Knicks, which was built around continuity. That 4-3 series loss was understandable and ultimately not a giveaway. From 1959 through 1968, Baylor’s Laker teams simply weren’t as good as the Celtics. Boston had the more complete group with a better 1-through-5 lineup and a superior coach. Only in 1969, when Chamberlain joined the Lakers (from the Philadelphia 76ers) and Bill Russell was on his last legs, did Baylor find a roster which should have won the Finals against Boston. Baylor failed even in that one instance out of eight when the table was properly set for him and the Lakers. Working for Donald Sterling in the Los Angeles Clippers’ front office was a far worse experience, but losing eight out of eight Finals? Even for someone such as myself, who is a big believer in the idea that second place in elite athletics is far more an achievement than a black mark, such a reality stings. Baylor’s heartbreak in the Finals makes Julius Erving’s struggles seem pedestrian by comparison. Yet, for someone with Erving’s skill level, and for someone who had such great players beside him in Philadelphia — George McGinnis and Doug Collins at first in 1977; then Maurice Cheeks and Bobby Jones; then Andrew Toney — it seems hard to believe that in his first six seasons with the Sixers, the Doctor couldn’t find the formula for an NBA title. Darryl Dawkins — an unpolished center — certainly left the Sixers wanting something more when Kareem-Abdul Jabbar was waiting in the Finals in both 1980 and 1982, but the Sixers were so strong at the other four spots on the floor that they should have found a way to break through. Their disappearing act in Game 6 of the 1980 Finals — at home, on a night when Kareem was injured and unable to play — represented one of the more profound failures in NBA Finals history up to that point in time. Baylor’s loss to Boston in Game 7 of the 1969 Finals was one of the few instances which — in terms of severity and anguish — clearly surpassed the 1980 Sixers’ failure against the Lakers. Doctor J — fourth on our list of the all-time greatest NBA small forwards (fifth on one ballot, third on the other) — and Baylor (third on one ballot, in the 6-8 range in the other) both represent how difficult it is to win even one NBA title. Erving finally got his one championship in 1983 after Moses Malone came from Houston and gave the Sixers the center they needed more than they might have realized in 1980 or ’81. Yet, the idea that Erving — a member of so many formidable squads — won only one NBA championship seems out of step with the enormity of the Doctor’s talent. Compared to Erving and Baylor, LeBron James — the best small forward of all time — owns a King’s platter of riches, with two titles. Yet, stop and realize that two championships are merely 40 percent of what Tim Duncan has hauled in with the Spurs, and only a third of what Michael Jordan claimed with the Bulls. LeBron — despite being a no-doubt top-5 all-time NBA player right now (regardless of position) — has that oppressive 2-4 record in Finals. He couldn’t do much about 2007 or 2015 with flawed or injured Cleveland squads. He couldn’t do much about 2014, with the San Antonio Spurs playing the same exalted team basketball the Portland Trail Blazers used to ruin Julius Erving’s dream of a title in the 1977 Finals. However, in 2011, LeBron plainly cracked under pressure. He failed to seize each and every moment of importance after Miami strolled to a win in Game 1 against the Dallas Mavericks. If LeBron had won that series in 2011, he’d have three titles, the same as the number two small forward of all time, Larry Bird. He wouldn’t have a losing record in Finals series. Yet, when you lose that one series you should have won — 1969 for Baylor, 1980 for the Doctor, 2011 for Bron Bron — the large crowds that look only at championships and little else can be extremely unforgiving.